I am a big fan of a beautiful smile. What makes a great smile? Great teeth! So for Halloween, don’t forget to show off those chompers. If you decide to be a goblin, vampire, werewolf, or evil fairy, don’t forget your fangs. You can use the plastic ones they make for small children, but where’s the fun in that? Why not try a pair of resin fangs that are fitted to your teeth? Most fangs you purchase will cover your natural teeth like a cap. You can find fangs in a variety of shapes, sizes and colors. Colors range from purple, blue, pink, gold, silver (to add a little bling to yo Halloween!) and even blood tipped fangs. You can get a pair of fang for the top. Or a pair of fangs for the top and bottom canine teeth. 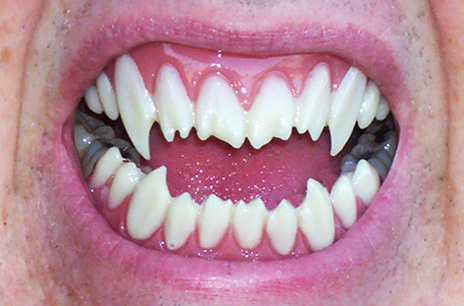 You can also find fangs with a set of three or four, for the top teeth only. And then, for those really serious about their look, you can buy temporary veneers to cover the front row of both top and bottom teeth. 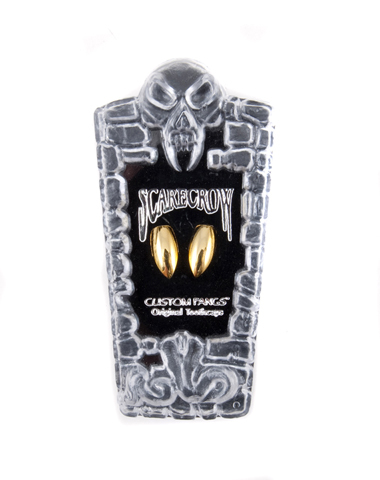 Brands like Scarecrow are well-known and the easiest to find brand of cap teeth. Usually you can find these at Spirit Halloween or even Wal-Mart. They cost about $5 and up depending on which set of fangs you purchase. I have tried the scarecrow fangs before and they were decent. A little bulky and they inhibited my speech, but they got the job done. There are even retractable fangs you can buy at Target or online at www.vampfangs.com. I haven’t used retractable fangs before, but the concepts sounds pretty darn cool. If you have a few shekels burning a hole in your pocket, you can try the line of temporary “veneers”, like the ones from Dental Distortion. They have a full line of fangy “veneers” that are worth a look. I am putting them on my wish list. The price range starts at $26 for just the top teeth. You can get upper and lower “veneers” for a little extra. I used the quotes because I don’t want anyone to confuse these with actual dental veneers that are bonded to your teeth. These “veneers” are easily removable and fit in front of your own teeth. The placement may cause your mouth to protrude more, but it adds to the creepy effect. 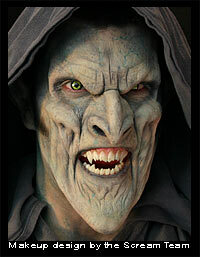 Excerpt from website: FX Fangs are fake teeth ‘veneer’ style products that cover only the front of your teeth. Made from high quality dental acrylic and designed for ultra-realism, each set is meticulously stained by hand. No two sets are the same, just like real teeth! The fangs I created made me want to attack my classmate! You can also make fangs yourself. 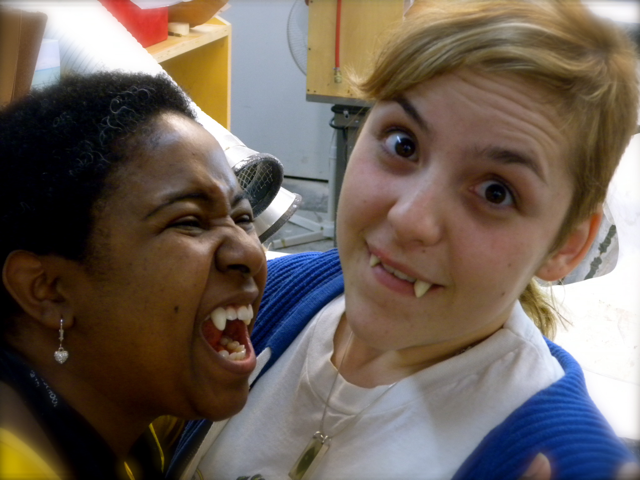 I still have the pair of fangs I made in school. I may even make a new pair for Halloween this year… maybe. I will do another post on creating your own fangs, when I have more time. Right now I am busy trying to decide what I should be for Halloween. I am not sure what costume and makeup I will choose yet, but I know for sure that I want to wear fangs.